Ever since I first laid eyes on this set, I knew that the big daffodil needed to be popped-up on a card! This card totally started life as something else. I've spent the last two days pulling this card apart and putting it together again. It wasn't even supposed to be done using this set -- I was trying to do something with those darling little butterflies using the Beautiful Wings embosslit. I had a bunch of butterflies cut out and dusted with pale green ultra-fine glitter. Anyway, I layered Certainly Celery, Perfect Plum, Glorious Green and sheets from the Shades of Spring ds. Both ds layers are sponged around the edges with Glorious Green. I watercolored the image and cut it out, cutting out an extra of the large flowers to pop up on a Dimensional. 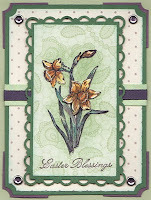 I sponged behind the image with some Certainly Celery to make the daffodils stand out a little more. I used my white gel pen to highlight the daffodils. Lovely card. You did a really nice job with the daffodil...the coloring & gel pen, nice touch. I get my new stuff tomorrow and can't wait to use the new border punch like you did. Love the dsp too!